Hilltop Products is one of the UK’s leading manufacturers of heat shrink tubing, plastic cable ties and thousands of other cable management products. 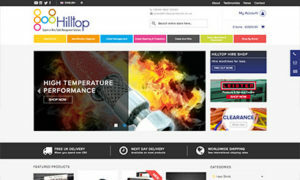 Warrington-based Hilltop Products is one of the UK’s leading manufacturers and suppliers of cable management products. Whilst they serve larger trade clients in industries such as Aerospace and the Military sector, they also supply to smaller businesses and end consumers, taking advantage of the additional revenue opportunities created by having a strong online presence and eCommerce facility. With over 3000 products on offer, the sales potential is huge. The Artlab updated Hilltop’s Magento eCommerce website, making it responsive (mobile friendly) and improving the design to boost credibility and increase conversion rates. Ongoing work is being carried out to improve the content on the site and it’s search engine visibility. We took over management of the Google adwords campaign in June and worked hard to improve the results as quickly as possible. Prior to the completion of the Magento website, The Artlab gave Hilltop Products instant results by taking over the PPC campaign - boosting online revenue by more than 35% while reducing ad spend by 14%. The PPC team completely revamped an AdWords and Google Shopping campaign to spend less and earn more. The PPC team trimmed the Google AdWords fat, improving low quality score keywords and relevance across ad groups. This led directly to a reduction in the cost per click from an average of £1.02 in 2015 to just 58 pence in 2016, down by 42.9%. Through extensive negative keyword scouting (ie ensuring Hilltop's ads would only appear for those phrases that are more likely to lead to a sale) we were able to boost conversions by a massive 49.29%. The PPC campaign has an immediate impact on revenue, increasing PPC revenue by more than a third in the first six months (35.39% year on year). By creating improvements and streamlining across the board, The Artlab were able to bring down the cost per conversion down very significantly - a reduction of 42.6% on the previous year. This is a fantastic result. We will be working ongoing on improving the website and SEO / Google Adwords with The Artlab.